Like pretty much every Saturday I made my weekly pilgrimage to Costco. It was so nice to do so in cooler weather! Not much to show today, for which you're probably sighing in relief. Here's an eight-pack of spaghetti, which lasts us a long time. 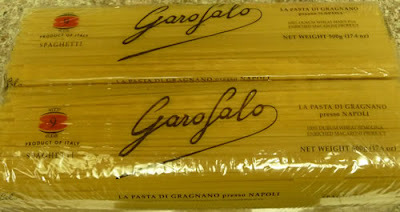 I used to get pasta at Trader Joes but their selection has been hit and miss lately so I made it easy by buying Costco's gargantuan pack so as not to worry about it. 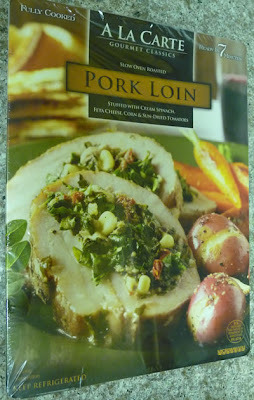 Here's a package of prepared pork loin to try out. And finally, olive oil. I like Costco olive oil - it seems of good quality and is relatively inexpensive. This isn't the one I usually get but the label on the back says it is distributed by Costco so I took a chance and put it in the cart. After dropping off the Costco loot I headed to my parents house where my sister was spending another Saturday trying to clean up the place. Lest you think I am a negligent brother by not helping (which actually I am), my reasoning is that she's the one who wants to keep a bunch of things whereas I already picked out about ten items and said I don't want anything else. 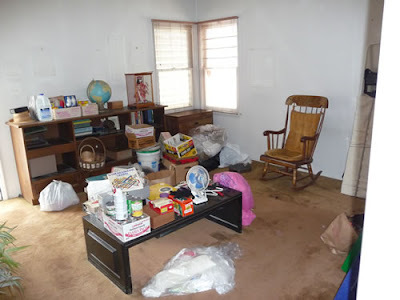 If it was up to me, everything would already have been gone, either sold or given away to friends and relatives, or donated, and whatever was left hauled away by one of those house-clearing services. My sister and my cousin Joyce are horrified at my sinister shock and awe way of thinking so I bet they're happy that I stay away from there, haha. I was looking at it and pulled off the grill to see what condition the speakers were in. Then I made my discovery. "Hey, there's no speakers anymore," I told my sister. 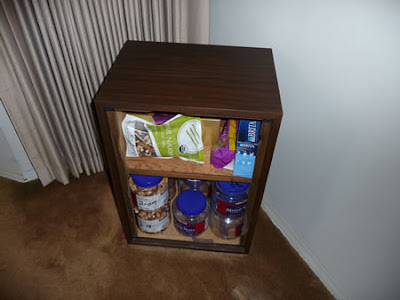 Like a squirrel, my dad had taken out the speakers, put in a shelf and used the enclosure to store a bunch of jars of Costco nuts and other food items inside. We got a good laugh out of that, except the coworker and her hubby showed up to get them. 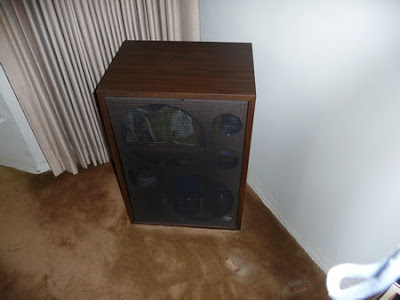 He was disappointed to see they were no longer speakers, but I told him they were lousy no-name brands anyway so it was better that he didn't buy them. Their trip wasn't wasted because they came for some other things as well. There's stuff piled all over the place. Here's a picture of my old room, looking totally different from the days of my occupation. No more stereo, black light posters, lava lamp, drums, etc. From there I went out to West L.A. to have lunch with Katie. She's renting a duplex with three other people and it just so happens their washer was broken so I found a buyer for my folks old washing machine. We went to a nearby old-time coffee shop/diner-type place called Teddy's, on the corner of Pico and Bundy. It used to be called NuWay but now it's Teddy's and inside it definitely looks OldWay. But the food was pretty good. 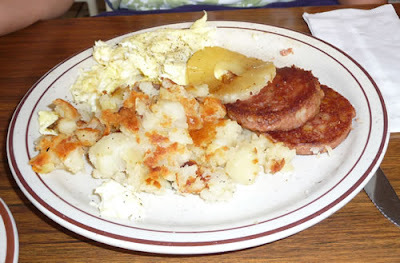 Here's Katie's hash and eggs. I forgot to snap the pictures until after we started eating so one of the hash patties is already in her stomach. 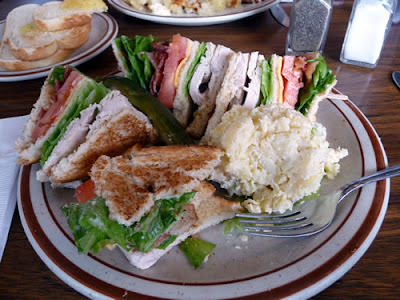 Here's my club sandwich. They put a lot of nice, thick bacon in it as well as real sliced turkey, not that pressed sandwich stuff. After dropping Katie off, I visited my folks at Keiro. They seemed to be doing fine. Things seemed normal, as they were arguing. Dad: You're not supposed to wear those open shoes. You're supposed to wear the kind like I have or Rickie has that are closed. Mom: No one said anything to me. Dad: And you're supposed to wear cotton socks, not hose. Mom: They haven't said anything about it. I still wear these. Dad: That's not the point! You're still supposed to wear the closed shoes, not those. You're going to hurt your foot. Me: What size shoe do you wear? Dad: Well you might need to get something bigger, like a size 6 because when you wear cotton socks those are thicker than hose so you'll need more room. Mom: I'm not going to wear any cotton socks. Dad: You're supposed to wear cotton socks. Mom: No one said anything to me about that. Dad: Didn't you hear them tell you that at the meeting we all had? The head person here said you need to wear these kind of shoes (points at his own sneakers with the velcro fasteners), not those (points at mom's shoes). Rickie, you heard that too, didn't you? Me: Well we can always get those kind of shoes real quick so it's not a big deal. Dad: Yeah, well I guess so. Finally I got home. I brought the approximately 60 or 70 boxes of Kleenex inside that my sister and I split up (mine was net of giving about 15 boxes to Katie's roommates). Why my mom bought so much Kleenex, who knows..
Then it was off to have dinner with Julie's side of the family, an event my buddy Donna refers to as "SNWP" (Saturday Night With Popo"). First it's always a stop at her mom's place because everyone is supposed to eat soup. After soup, the routine is we go to a restaurant. 99% of the time it was the struggling to achieve mediocrity Ritz Gardens in Alhambra since it was nearby, but they went out of business and the spot is now occupied by the much more posh King Hua. That's where we went tonight. If you ask me, the food isn't much better, if any, than it was when it was Ritz Gardens but you pay about 2 or 3 times as much for it. One thing my MIL's place and King Hua have in common: they are both LOUD. We enter my MIL's place and the volume is near max on the television and so are the speaking volumes of her family. We're talking jet takeoff levels. Since they almost always talk in Chinese, I take a book with me and sit on the sofa reading amidst the cacophony. Tonight I took my book about Microsoft Vista. I think the noise level is so high that my brain becomes numb and I start getting sleepy; just when I am about to doze off, Julie tells me it's time to go the restaurant. There was a wedding taking up most of the spacious room at King Hua. And it was LOUD. I am getting over an annoying cough and hate to cough and bother people, but here I could cough as loud as I wanted without being a distraction. Everyone had to shout to be heard, even to the person next to them. The MC spoke in Chinese and Julie started laughing. She said he told everyone that the groom's brother wasn't there because he was working too hard and didn't have time to attend. Anyway, contrast the serene, pin-drop atmosphere at Keiro that is like being by a koi pond, versus the mosh pit megadecibel atmosphere of my MIL's place and King Hua. I thought that was pretty funny. Then we came home and I planned on trying to get things ready for my attempted conversion to Microsoft Vista on Sunday but first I wanted to write this blog entry. Now it's too late to do any Vista prep, but that's okay, so far it looks like a clean slate the whole day after church tomorrow. I may go ahead and try that conversion, so like I said before, if you don't see a blog entry on Monday, you can figure out what happened. Today's entry was long enough for the whole week anyway. p.s. - wouldn't that be something if you could modify an accordion to do that? Hey - where are those drums coming from? ?